The ROG Strix X470-F Gaming motherboard from ASUS offer everything you would expect from a high-end motherboard accept for the high-end price! 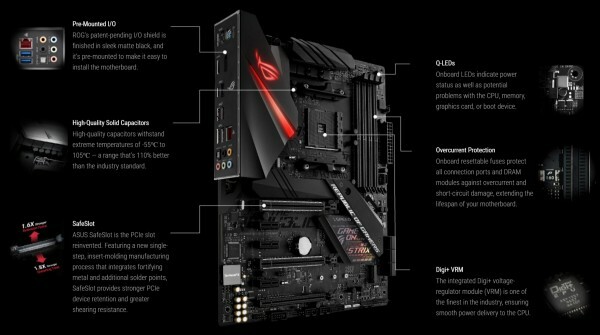 The ASUS ROG Strix X470-F Gaming is the perfect fusion of performance and panache. It's an ATX motherboard packed with easy-to-use tuning tech and understated aesthetics for those who demand great gaming experiences and refined style. Strix X470-F Gaming keeps the pedal down on performance, and its rich customisation options let you push your rig from subtle to standout in seconds. The AMD X470 chipset delivers outstanding overclocking capabilities for the latest AMD AM4-socket Ryzen processors, 7th Generation A Series APUs and Athlon CPUs. It is optimised for multiple GPU configurations including NVDIA SLI and AMD CrossFireX. It also provides two 10Gbps USB 3.1 Gen 2 ports and six 6Gbps SATA ports for faster data retrieval. Take care of complex tuning with just one click. ASUS 5-Way Optimisation makes your PC smart by dynamically optimising essential aspects of your system, providing overclocking and cooling profiles that are tailored for your rig. Tuned to take full advantage of Ryzen's capabilities, and ready for the latest memory kits, ROG Strix X470 Series motherboards are built specifically for high-performance gaming rigs. Intelligent firmware delivers the plug-and-play experience that first-time DIYers demand and the essential tuning options that performance-addicts need. Maximise frame rates with a high-bandwidth memory kit, or leverage a host of tuning options to extract peak performance potential from a modest setup. Load up any way you want, and get into the game with Strix X470 Series motherboards. 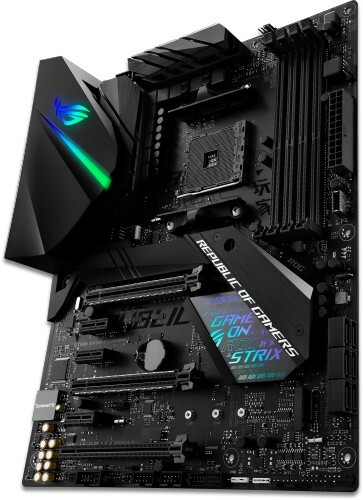 ROG Strix X470-F Gaming features the most comprehensive cooling controls ever, configurable via Fan Xpert 4 or the UEFI BIOS. 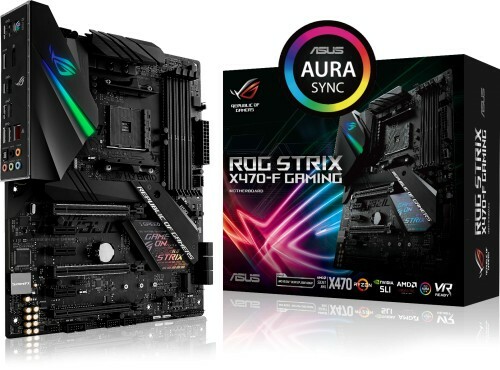 Strix X470-F Gaming takes ASUS Aura into the home, with the all-new ability to synchronise effects with Philips Hue personal wireless lighting. Now you can control Hue light bulbs, strips and lamps from the intuitive Aura app. Create immersive illumination that extends beyond your rig — make the whole room part of your gaming experience. The ASUS Aura ecosystem is in the ascendancy, with an extensive and growing list of ASUS products now offering Aura Sync compatibility — along with loads of compatible accessories and kits available through partners. Your ROG Strix motherboard's built-in Aura RGB lighting can be easily synced with PC cases, memory modules, coolers and RGB LED strips from a broad selection of well-known manufacturers. And they can all be easily managed via the intuitive ASUS Aura software. ROG Strix X470-F is equipped with a stylish, angular M.2 heatsink that keeps your SSD cool. By efficiently dissipating heat away from the M.2 area, Strix X470-F minimises the possibility of performance-sapping throttling, which can occur when drives become too warm.